Steal a locket from a Redoran bigwig, and give it back to its owner. Talk to Jim Stacey at Simine Fralinie's Bookshop in Vivec, Foreign Quarter about the Bal Molagmer to learn about this gang of good thieves. Put on the Bal Molagmer Gloves Jim gives you and talk to him again for a new job. Travel to Venim Manor in Ald'ruhn to recover the Hlervu Locket. Retrieve the locket and return it to its rightful owner, Braynas Hlervu, outside his house at the east end of town. When you speak to Gentleman Jim Stacey at Simine Fralinie's Bookshop in Vivec, Foreign Quarter Canalworks, about Bal Molagmer, he will tell you the legend of the "Stone Fire Men" (assuming you've reached the rank of Footpad or higher in the guild). The Bal Molagmer were thieves that stole from the unjust and gave to those in need (much like a Robin Hood of sorts). They vanished early in the Third Era and have not been seen since. Jim believes it is time for the Bal Molagmer to return (to possibly help the bad reputation of the Thieves Guild) and gives you two Bal Molagmer Gloves as a symbol. Put the gloves on and speak to Jim again to receive the first Bal Molagmer quest to return a locket to Braynas Hlervu, a poor, retired egg miner who exchanged his family's treasured locket to pay his annual taxes. The Hlervu Locket is at Venim Manor in the Ald'ruhn Manor District. 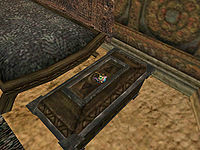 The locket can be found on top of a chest inside a room in the guard wing of the Venim Manor. It is the second-to-last room on the left in the Guard Quarters. Deliver the locket to Braynas Hlervu. He is standing outside his house at the east end of Ald'ruhn. Be sure that when you return it, you do so in the name of the Bal Molagmer. 1 Gentleman Jim Stacey told me of the Bal Molagmer. How they once carried the light of justice throughout Morrowind, stealing from the unjust, and giving to the poor. He gave me a pair of Bal Molagmer gloves, which I should wear before speaking with him again. 10 Gentleman Jim Stacey asked me to find the Hlervu Locket in Venim Manor in Ald'ruhn and return it to Braynas Hlervu in the name of the Bal Molagmer. 30 I gave the locket back to Bolvyn Venim. 50 Braynas Hlervu accepted the Hlervu Locket as a gift. 55 Braynas Hlervu accepted the Hlervu Locket in the name of the Bal Molagmer. 100 Finishes quest Gentleman Jim Stacey thanked me for returning the Hlervu Locket to Braynas Hlervu. 110 Finishes quest Gentleman Jim Stacey was upset to hear that Braynas Hlervu was dead, but he believes there is other work the Bal Molagmer must do.